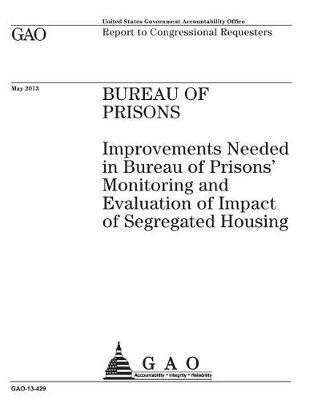 U S Government Accountability Office: Bureau of Prisons: Improvements Needed in Bureau of Prisons Monitoring and Evaluation of Impact of Segregated Housing: Report to Congressional Requesters.
" BOP confines about 7 percent of its 217,000 inmates in segregated housing units for about 23 hours a day. Inmates are held in SHUs, SMUs, and ADX. GAO was asked to review BOP's segregated housing unit practices. This report addresses, among other things: (1) the trends in BOP's segregated housing population, (2) the extent to which BOP centrally monitors how prisons apply segregated housing policies, and (3) the extent to which BOP assessed the impact of segregated housing on institutional safety and inmates. GAO analyzed BOP's policies for compliance and analyzed population trends from fiscal year 2008 through February 2013. GAO visited six federal prisons selected for different segregated housing units and security levels, and reviewed 61 inmate case files and 45 monitoring reports. The results are not generalizable, but provide information on segregated housing units. "